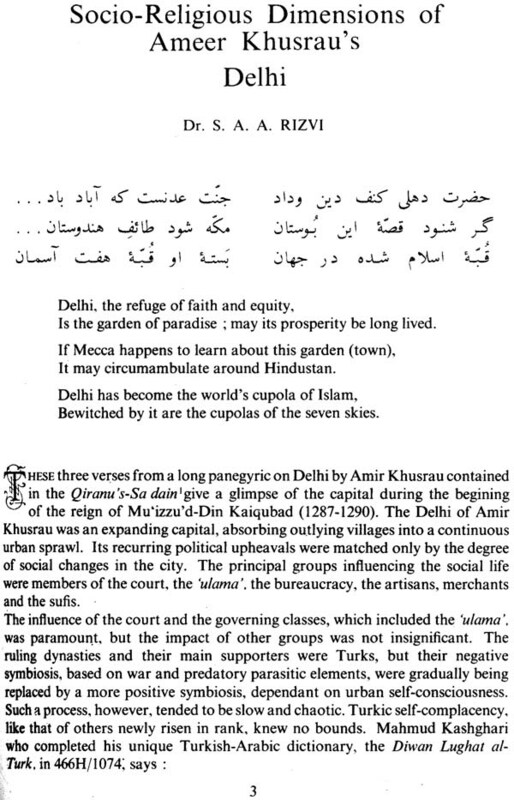 Seven hundred years ago, in the city of Delhi, there lived a remarkably versatile man, Amir Khusrau. Poet, writer, humorist, historian, soldier, courtier, mystic, musician - he was all this and much more. Above all, he was a deep humanist and, in spite of his foreign origin, was a great lover of everything Indian. Variety was the essence of his life and nothing was too high or too low for him. The pomp and grandeur of the royal court, the humdrum gaiety of the bazaar, the elevating and soothing atmosphere of the Khanqah, and the din and clatter of arms in the battle-field, all went into the shaping of his colourful personality. The court and the countryside, the monastery and the market-place, all were equally significant for him. He mixed with kings and commoners, sufis and soldiers, poets, scholars and musicians, drank deeply of life, and gave of his best in fascinating abundance. During the 72 years of his varied life, he wandered far and wide in the country, studying its flora and fauna, languages and customs. He travelled to the farthest confines of the Sultanate - from Delhi to Deogir, from Multan to Lakhnauti - and studied and enjoyed the rich variety of life which India had to offer. He witnessed the dramatic rise and fall of great dynasties and lived through the reigns of seven kings. Rich indeed was the harvest of his experience, but richer still was what he gave to the world. His ragas and his riddles, his poems and his puns have delighted millions down the centuries, and even today his Persian ghazals are sung not only in Deltii, Lucknow and Hyderabad but also in Lahore, Tehran and Tashkent. This volume is a collection of articles written by eminent scholars on the life, times and works of Amir Khusrau. The celebrated author and journalist Professor Zoe Ansari is well known in India and abroad for his outstanding contribution in the field of Urdu language and literature. Professor Ansari hailed from Saharanpur (U.P.) Having completed his early education at Meerut, he went to Allahabad and then to Bombay for higher and advanced studies. In Bombay he associated himself with the progressive movement. He has held the posts of the Head of Foreign languages, Deptt, of Bombay University and member of Maharashtra Urdu Academy, Jamia Urdu Aligarh and the Executive Committee of Ghalib Institute, New Delhi. He was also the General Secretary of National Ameer Khusrau Society, New Delhi. Professor Ansari was also associated with the A.I.R. and T.V. and a number of learned bodies and journals in India and abroad. Professor Ansari published 36 books, the latest being "Iqbal-ki-Talaash". Prof. Ansari died in February 1991. I was a member of the delegation of the university grants Commission invited to the Union in 1968 to study its system of higher education. In the course of our stay in Moscow it was my good fortune to visit the institute of Oriental studies of the academy of social sciences and to meet its distinguished head. Academician B.G. Ghafurov and to discuss with him matters of common interest to our two countries. In the course of our talk, academician Ghafurov mentioned his institute’s intention to celebrate the seventh centenary of Amir Khusrau’s birth in Moscow and I suggested that as khusrau was first and foremost an Indian and a great Indian it would be more appropriate if the centenary was first celebrated in India. The suggestion was well taken and upon my return I referred to this talk in the report of the delegation and requested that it should be brought to the notice of the Union Ministry of education and culture. The frequent changes that followed in that ministry unfortunately delayed action until my friends and one time colleague Prof. Syed Nurul Hasan became Minister of state for education Social Welfare and culture. Insisting that the celebration of such a national event should be under the auspices of a senior member of the Union Cabinet he requested Shri Fakhruddin Ali Ahmed then minister for Industrial development to undertake the task and lent him the assistance of Dr. Sajjad Zaheer himself a scholar writer and poet. The burden of a heavy ministerial charge followed later at a critical period by the heavier responsibilities of the ministry of food and Agriculture did deter him from taking active interest in the work of the celebration committee as its president despite the misfortune of the sad death about the same time of Dr. Sajjad Zaheer. Shortly afterwards to the benefit of India but to the loss of the Committee Shri Fakhruddin Ali Ahmed was elected president of India and had consequently to relinquish charge of the Committee. He however accepted to be its chief Patron and honored me by proposing me as its president which the committee unanimously accepted. The national Amir Khusrau Society has since taken over the work of organizing the celebration. 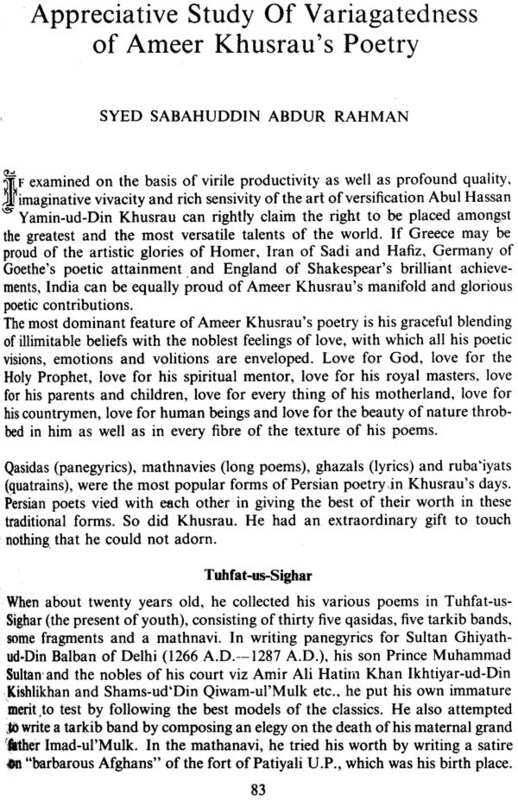 Its aims go further in the sense not only of promoting the study and appreciation of Khusrau’s life times and works but also the perpetuation of his memory by among other things the establishment of institutions of lasting public benefit like libraries and schools dedicated to his memory and thus to the cause of the composite culture of India which he symbolized in this life and thought. Amir Khusrau was undoubtedly one of the greatest and most fascinating figures of his time. His many sided and varied attainments cannot be separated one from another except for convenience of study or analysis as they formed part of a fully integrated personality. Born in an age of turbulence, with a large part of Asia shaken and despoiled by the Mongol hordes under Ghengis Khan and his successors, the sufferings of his tribe and family, which led his father. Amir Saif-ud-din Mahmud, like many others, to seek refuge in India, must have rankled in his youthful mind. In the years to come, he was himself to witness the ruthlessness of a Mongol invasion when he managed only by chance to escape from capture by a Mongol horseman. Saif-ud-din married in India in a family said to be of Hindu converts to Islam. and Yamin-ud-din or Amir Khusrau. one of four off-springs from that marriage, was born in 1253 A.D. in Patiyali. a small township in the district of Etah in Uttar Pradesh, situated by the banks of the Ganges not far from Delhi. Losing his father while still in his teenage, Khusrau enjoyed his company only on the rare occasions of his return from the battlefield, but remembered him for his virtues which evidently made an indelible mark on his memory, for he has spoken of him in terms of more than purely filial affection and admiration. From then on. Khusrau was looked after by his maternal grand-father, ‘Imäd-ul-Mulk, while his Indian mother bestowed on him all the care of a devoted mother. 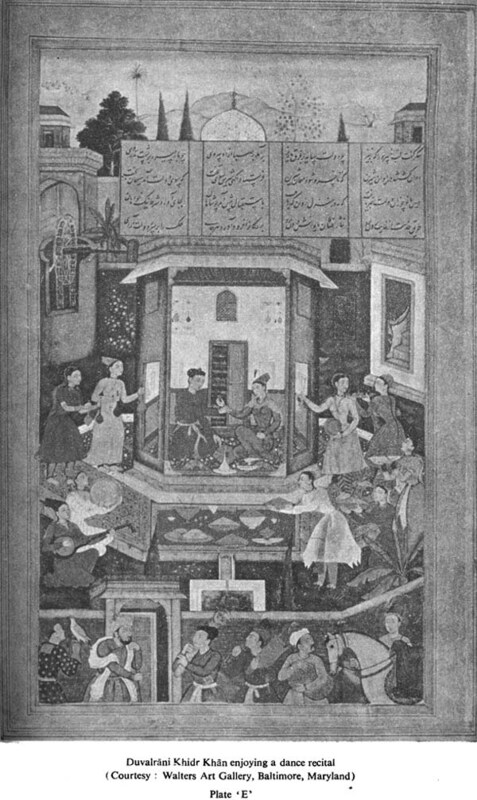 The lives of many famous men in history have been molded by the love of their mothers, and although little is known of this modest woman, Daulat Nãz, Khusrau’s adoration of her is enshrined in one of the finest elegies existing in any language which he wrote on her death, thus immortalizing her. ‘Imad-ul-Mulk. by virtue of his discernment, experience and wisdom, widely respected and made certain that his grand-children would obtain the best of instruction, and there is little doubt that Khusrau acquired much of the cultivation of his mind and its resilience to a world of variety and change from the example of his grand-father, himself an administrator and a man of the world. 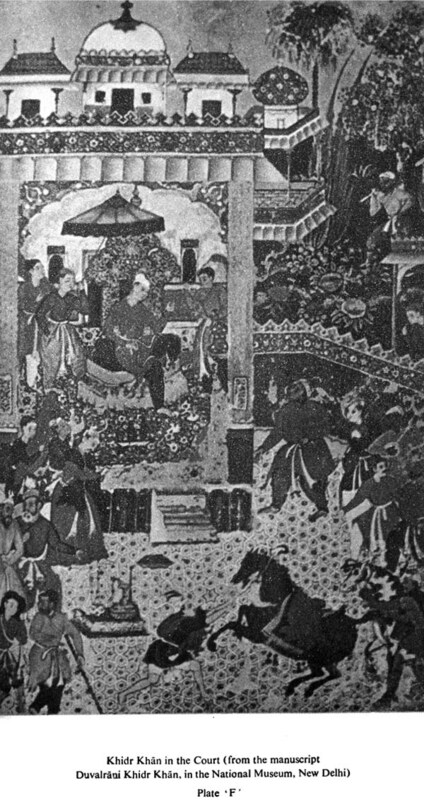 ‘Imad-ul-Mulk’s death, when Khusrau was barely twenty, obliged him to seek livelihood and patronage at the Courts of Kings and Princes and to experience there the striving for favor and the dread of displeasure, the scenes of refined gaiety and sordid debauchery, the incantations of poetry, music and song. the clarion calls to battle, the celebration of victory and the despair of defeat, and, above all, the cruel changes of fortune with one dynasty destroying another in rapid succession without the common man having a say. It was an age of dynastic ambitions and feudal rivalries, by no means unique to India. and one had to walk warily for survival. 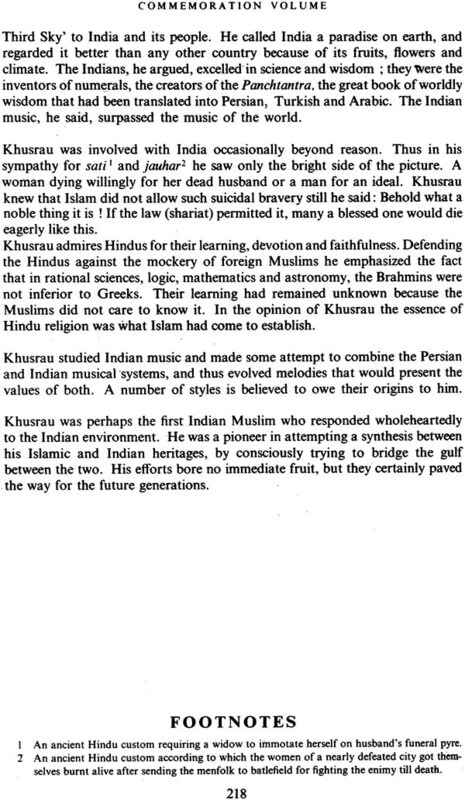 Khusrau was no exception. but it may be said of him that his panegyrizes to Kings, so customary at the time and so much in both demand and supply, seldom suffered from undiluted praise, for he had the courage also to advise on the conduct and duties of Kings. Courtier though he was, he never lost the common touch and was as much at home in the market place as in the palaces. His works reflect the variety of these experience and their quality and richness bear testimony to his having risen above the compulsions of his situation and surroundings and emerged unscathed. Only five out of an approximate total of fifty memoirs. Tazkiran and historical documents can be considered as the authentic sources that furnish information about the life of Yaminuddin Abul Hasan Khusrau Dehlavi. The rest are mere fiction or the imitation of the preceding accounts. Now Amir Khusrau’s original writings are to be accepted as the first source viz, the exordia of his first three poetical collection entitled Tuhfat-us-sighar Ghurrat-ul-Kamal and Baqiya Naqiya. 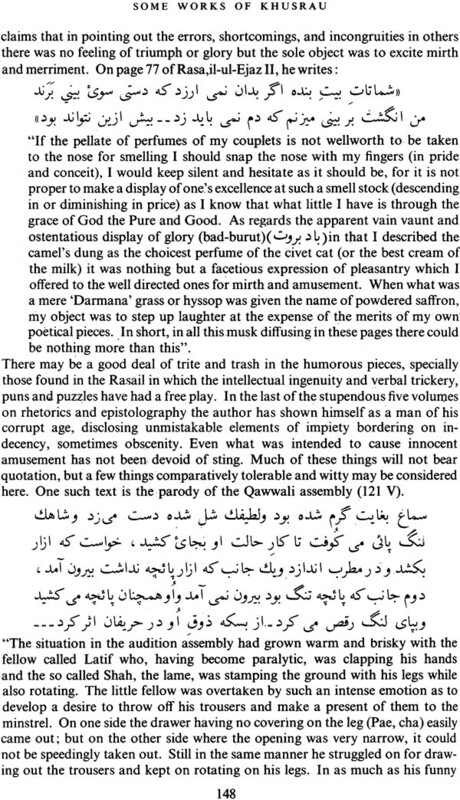 Moreover his various masnavis also carry the personal details for instance in Majnun-o-leili he laments the death of his mother and brother in Qiran-us-saadain he describes the fatal war of Mutan and his escape Ejaz-e-khusravi includes the accounts of his contemporaries their controversies the various styles in poetry and epistology and the events which he himself had witnessed. Khusrau’s own statements present us with his life size portrait. 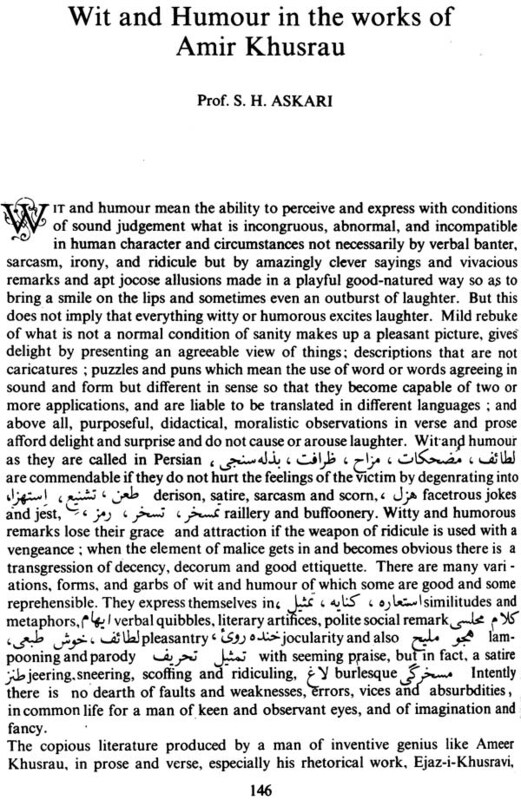 He has composed fifty to seventy couplets on his suffering from the inflammation of eye or sking but nowhere does he mention his wife and submit any description of children or the specific romantic experiences. Anyhow these glimpse through his poetry. The compositions of Amir Hasan Sijzi Dehlavi and the collection of the descriptive passages and utterances associated with Khwaja Nizamuddin edited under the title Fawaid-ul-Fuwad do serve as the second source for they have been preserved to this day without any distortion. 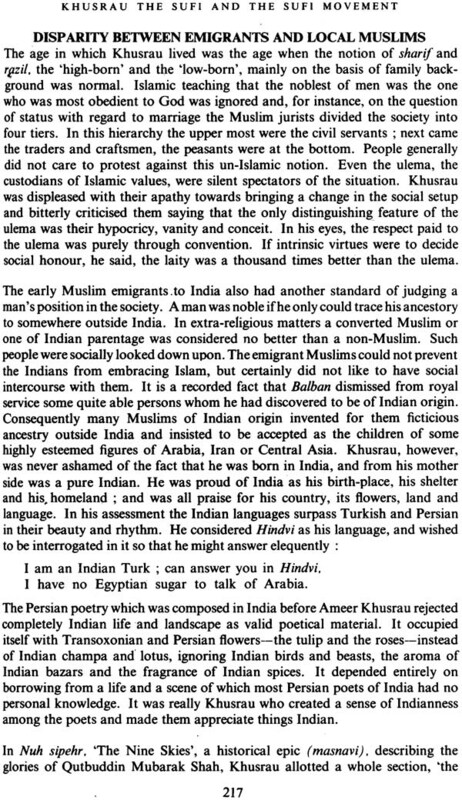 Amir Hasan was younger to Khusrau by two years and he survived him by two years. His ghazals like those of Khusrau were marked by lyrical pathos. Both had been in the company of the celebrated historian Ziauddin Barni. Hasan’s intimacy with Barni reflects on the reputation that Hasan enjoyed among the liberation of that period. He must be one of the two brilliant young poets whom prince Sultan the great connoisseur of art picked up from Delhi which was overflowing with poets and took him to Multan. 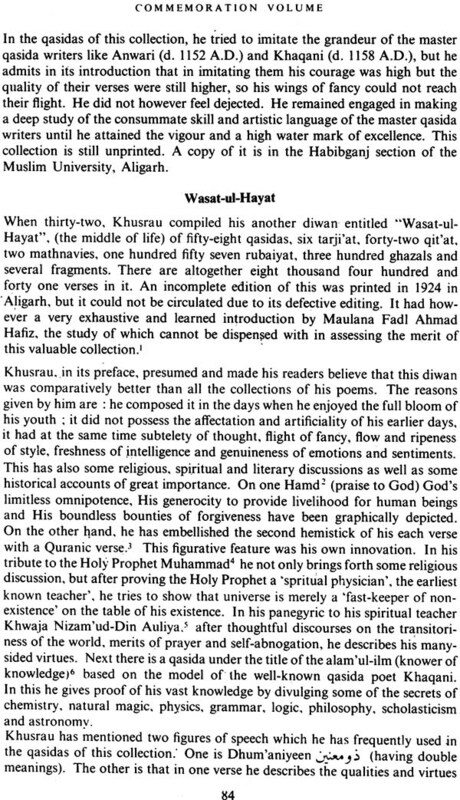 The third source is Tarikh-i-Firoz Shahi which Ziauddin Barnil completed thirty one years after Khusrau’s death. 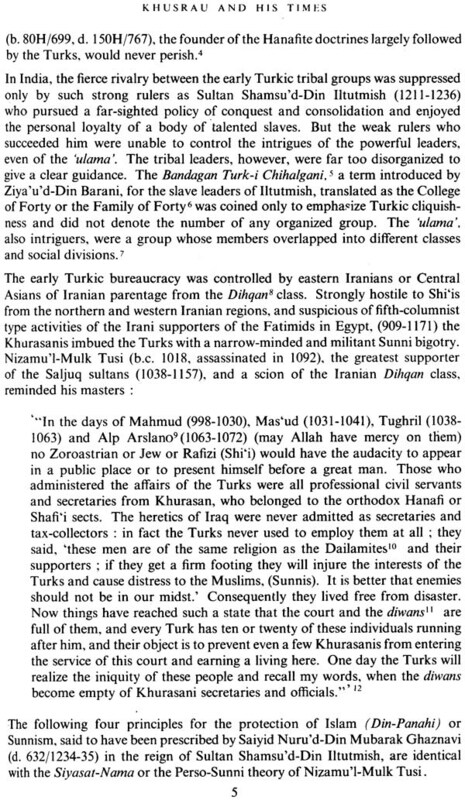 But in Barni we find no reference to those interesting stories of their relationship that were in fact concocted later by Daulat Shah samarkandi and repeated by others. The fourth source is the memoir Lubab-ul-Albab of Mohammed Aufi Bukhari who was a renowned Persian poet of 13th century. Aufi completed the memoir during his stay in India. It informs us about the literary tastes and the writers of that period that can help us have a truer assessment of Khusraus’s literary achievements and his position among the contemporaries. 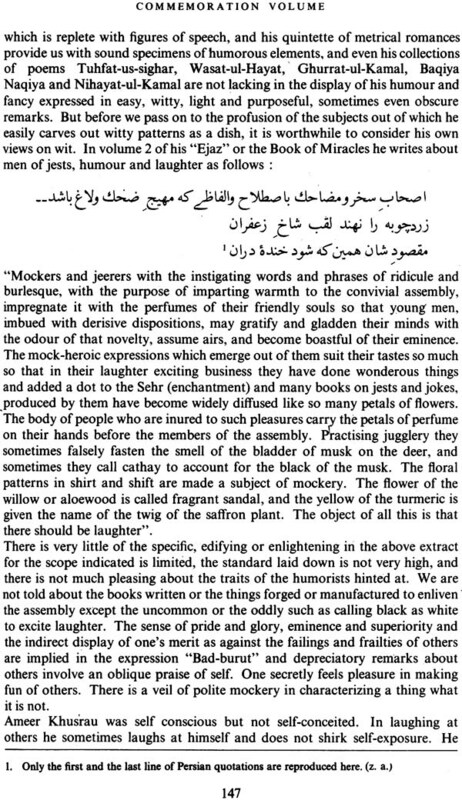 The fifth source is Siyar-ul Aulia a memoir by the sufi writer syed Mohammed bin Mubarak alias Mir Khurd. With much sincerity and religious devotion he carried out his research and after having gathered the possible material from different sources he completed his book in 1365 A.D. 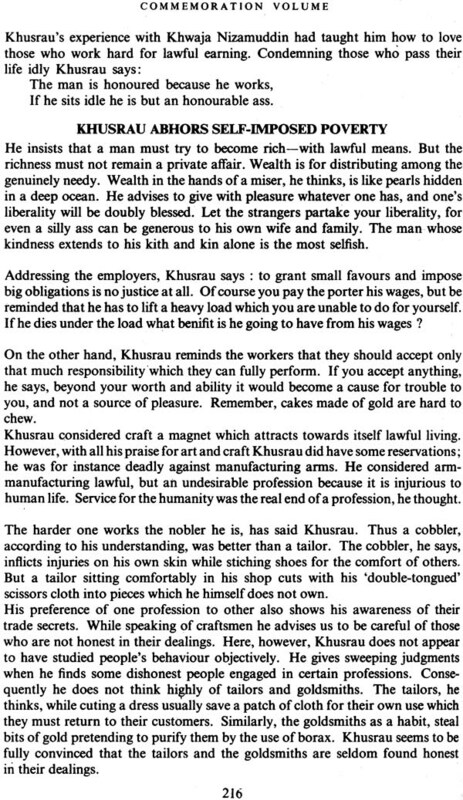 The various refernces to Khusrau are mainly based on the information furnished by his father and uncle who also used to attend Khwaja’s monastry like Khurau Mir Khurd summarises Khusrau’s character thus. 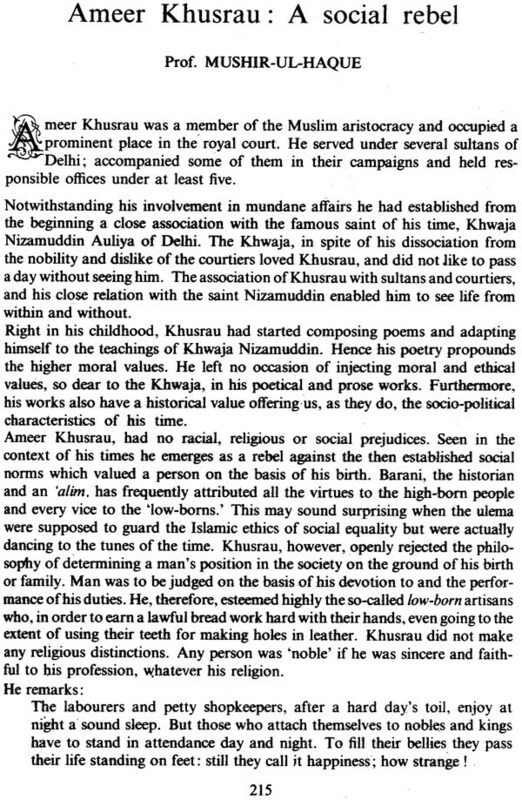 The above statement when considered together with the fact that he frequently visited Nizamuddin where Bahlul qawwal would sing Khusrau’s ghazals at the instance of Khwaja becomes still more significant as we find that Ziauddin while giving a detailed account of his scholarship and reputation at the court does not emphasize over his suffism.